I’ve been a professional editor for over seven years now and I have had the chance to do both linear and non linear editing. I remember the days of getting footage off tape, dealing with decks on livecast shoots, and more. However, I used the NLEs of the A-Team players (Avid, Adobe, Apple) and they have all come a long way. These days, I lean more towards being a Premiere Pro editor with a good understanding of Final Cut Pro X. I’m extremely impressed with the progress Premiere has made over the last five years, and I can’t wait to see more. I do, however, have some features I would like to see in future releases of Premiere Pro. 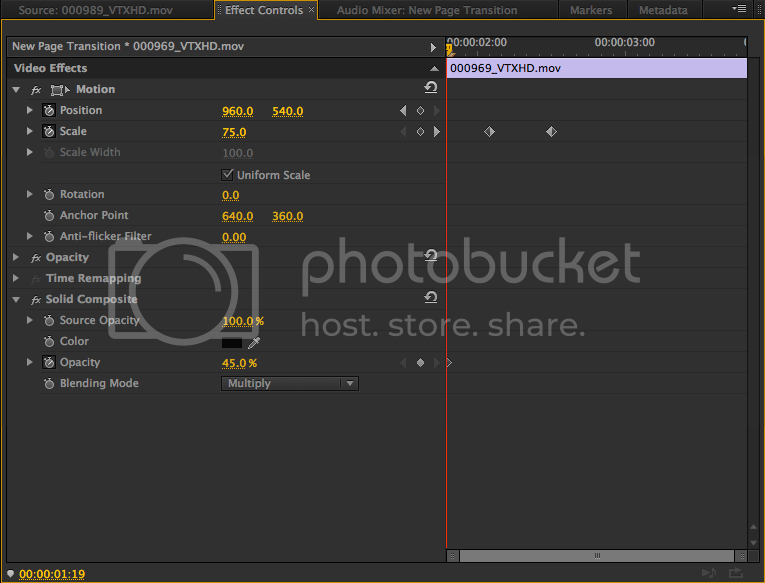 I have used the title tool in Avid Media Composer as well as the one in Final Cut Pro legacy. Both title tools provide less than optimal conditions for simple edits. Final Cut Pro X has the title tool advantage these days because everything is now a Motion Template. Premiere Pro’s title tool is slightly better than Media Composer and FCP Legacy, in my opinion. When you use the title tool in Premiere Pro, it opens up in a separate window. It allows you to create a title from scratch, utilizing the tools available, along with layer styles and a variety of templates. 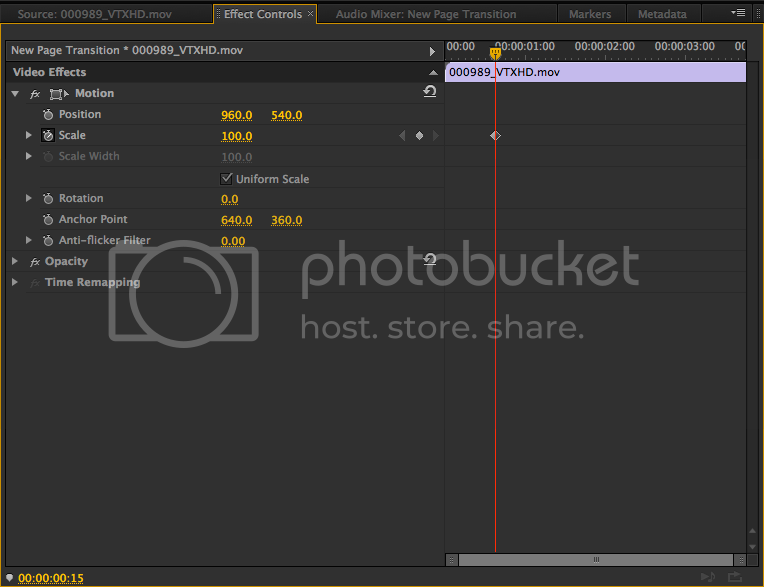 My problem with the Premiere title tool is that it is not as intuitive as I would like it to be. You have limited options for creating titles, which are relegated to static looks or roll/crawling text. For some users, it can be difficult to create more complex titles because of the lack of a layer system. This is why some people resort to using Photoshop and/or After Effects to take care of their title needs, such as lower thirds, bugs, or end credits. 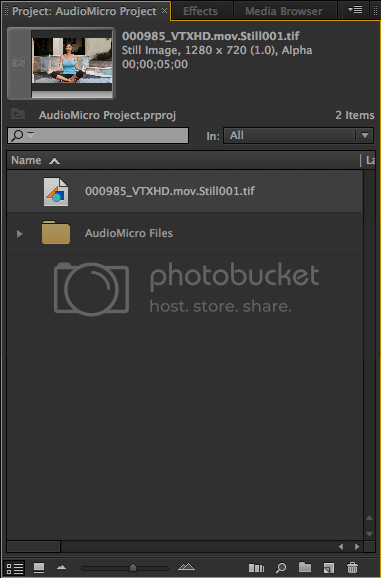 I’m all for using the accompanying programs in the Creative Cloud, but I believe an NLE should have strong title tools. 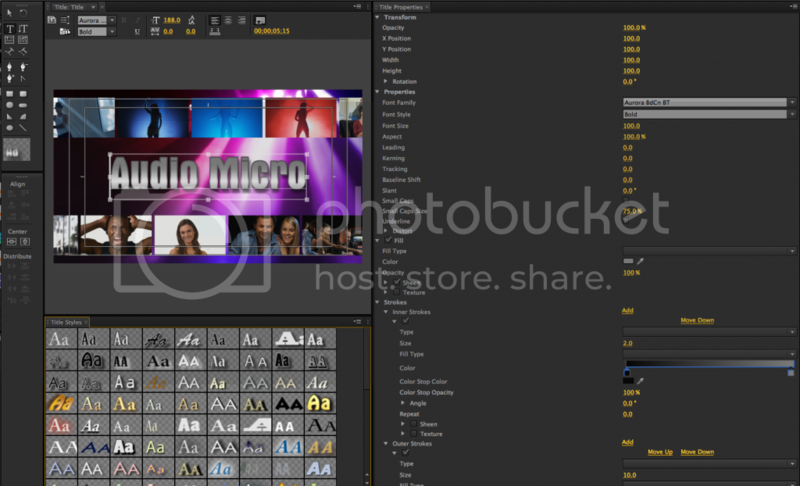 Users should only reach for Photoshop or After Effects when your title needs exceed the capabilities of the program. 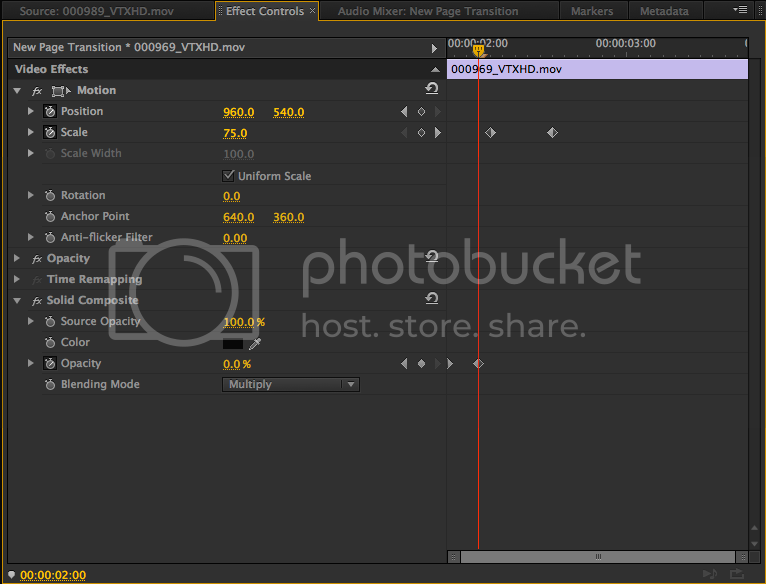 Here is how I would like title tool to function in future releases of Premiere. I would take a few cues from NewBlueFX Titler Pro 3. The video below showcases the ability to create a title or lower third graphic template and quickly modify it across your video. Ideally, I would like it to have a layer based system similar to Photoshop. This way, I would know when I am modifying an element, as well as have it appear as a multi-layered item in the project panel. 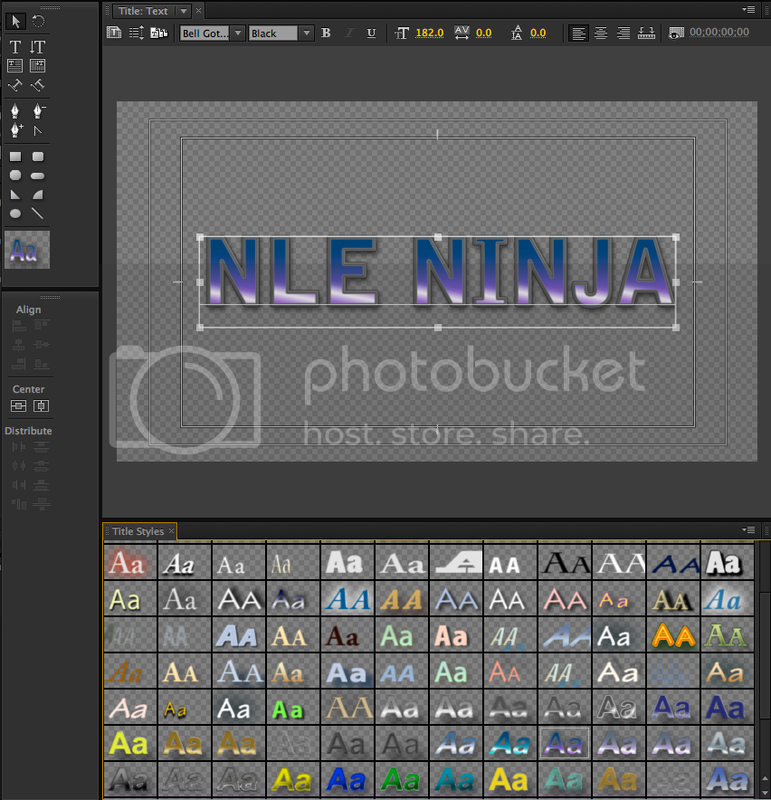 It would be nice if they could find a way to have text animation presets similar to After Effects. I could minimize my need to go to After Effects for something that mundane. Overall, a Title Tool revamp would definitely help alleviate some of the frustrations users have when using title tool. I’ve always had an uneasy relationship with Dynamic Link in Premiere. It could have been my computer specs or something else, but I’ve always found that it slowed me down as opposed to just rendering what I needed from After Effects, and making updates through re-rendering. One thing I would like to see that would help users who may not have high end computers, would be a dynamic link proxy to final render option. This would work by bringing an AE composition into Premiere, changing the option to be in full resolution or proxy format, and when the changes are locked in, give the user the option to render via Media Encoder into a format of their choice. Now, I understand that would take quite a bit of code to pull off, but under the new cloud format, it definitely gives both Premiere and AE teams something to work towards. The new Live Text Templates introduced in Premiere CC 2014 definitely show the level of innovation and cohesion users can expect with After Effects and Premiere Pro. I hope the next few versions of this feature will get to the level where it can compete with Motion templates. Knowing how much professionals rely on AE templates to complete projects, Premiere will be a force to be reckoned with if it gets to this level. One of the things I love about Premiere over FCP legacy is that I don’t have to double click a clip to adjust things like scale, position, rotation, or blend mode. Click it once and it shows up. I especially like what they did for the 2014 addition of Premiere Pro with Master Clip Effects. However, there are some items I would like to be added. I can only assume the Premiere Pro team is working towards the ability to move between keyframes with a keyboard shortcut. I would like the ability to have either Track Matte Key, Set Matte, or Image Matte Key as a part of the Effect Controls panel so I can easily do compositing from track to track. The benefit of this would be not solely relying on those filters, and I could more easily manage my compositing efforts when I move clips with those filters enabled. If anything, I would place it in the same category as the opacity parameter. Another thing I would like is for the motion parameter to have similar abilities to Media Composer’s 3D Warp filter, with a hybrid allowing you to turn layers 3D in After Effects, as seen in the video below. This would eliminate the need for the Basic 3D and flip filters, as well as allow users to do simple perspective rotation in a “3D” space. Right now, the Basic 3D filter isn’t as strong as its third party counterparts available from BorisFX, FxFactory, or GenArts. 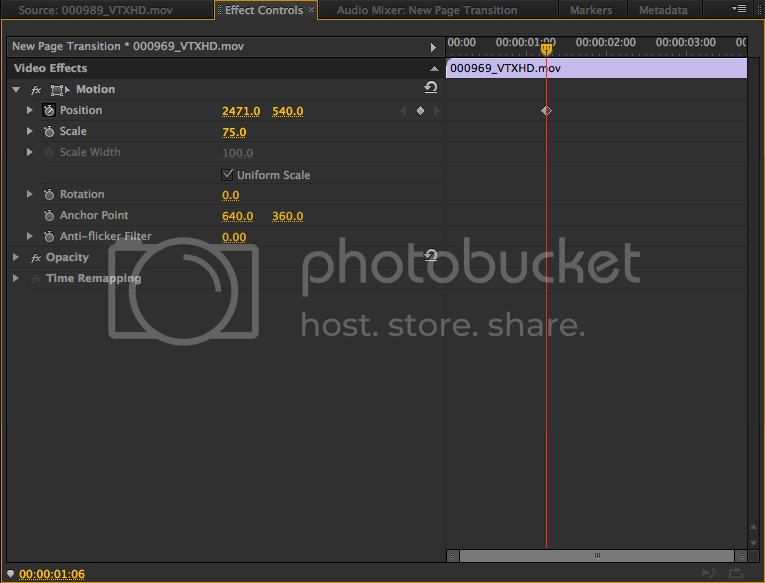 Along with the added Matte Key functionality, giving the motion parameter a hybrid of the abilities from After Effects and Media Composer would take Premiere’s animating and compositing capabilities up a notch. 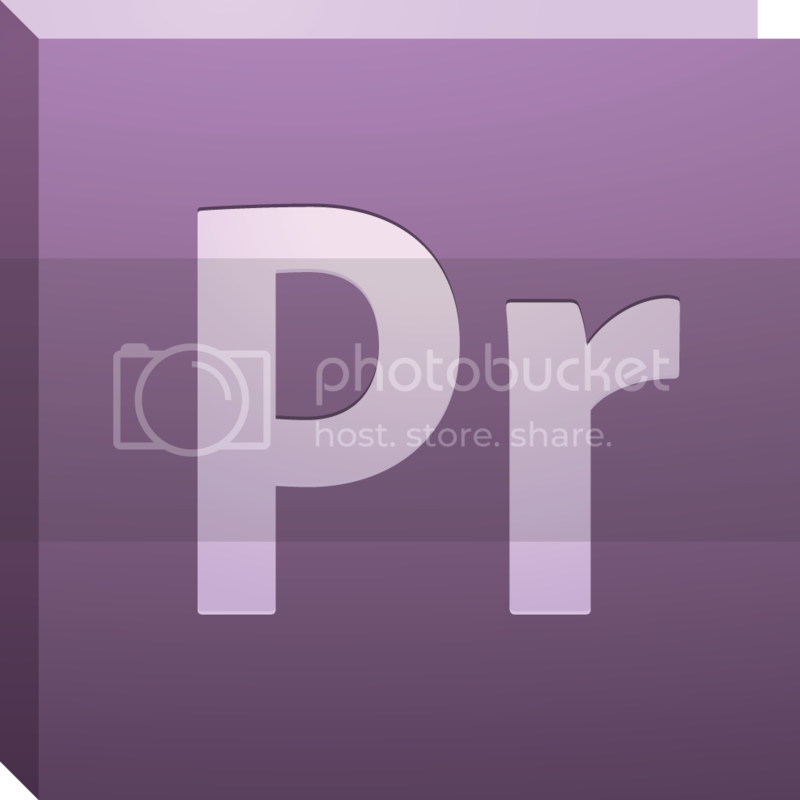 I like the current tools that Premiere Pro CC 2014 has now. I can select items forward and backward with two track selection tools. I can add keyframes with the Pen Tool. I can zoom in on my timeline with the Zoom Tool. I wouldn’t mind some tools for manipulating images. 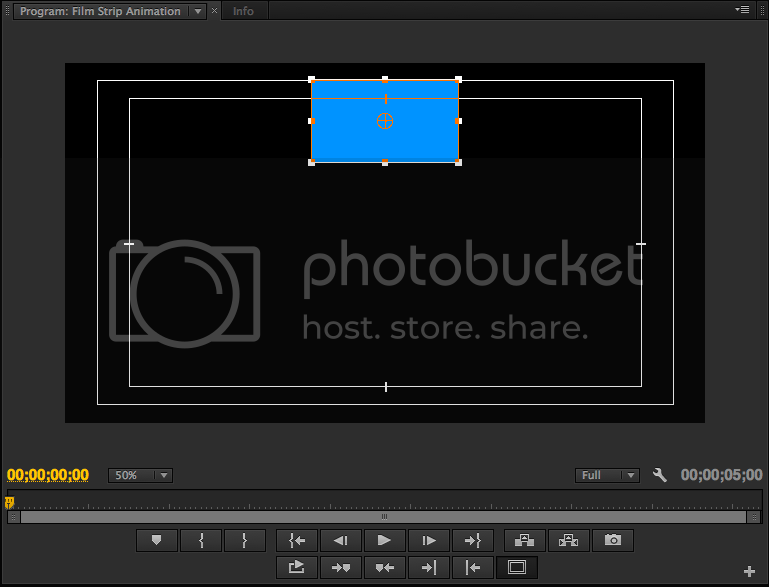 A pan behind tool would allow users to move the anchor point of their image without having to use slider values. A crop tool would eliminate the crop filter altogether, and would give users the crop abilities similar to FCP 7. Overall, an addition of a few more tools would greatly help the editing process and would reduce the need for editors to make painstaking adjustments. These are just a few features I hope to see, and with the way the various Adobe teams have been responding to their customers, it isn’t too far of stretch that this may happen in the near future. Right now, I rely on Premiere to make a living, and I have high hopes for what’s to come. As strong of a non-linear editor as Premiere Pro is, not too many users know how to take advantage of one particular tool it possesses… Title Tool. Having worked in multiple NLEs, I have to say that Premiere’s title tool is very versatile if you know how to take advantage of it. However, if it doesn’t immediately grab your attention, there are third party titling plugins available for Premiere that can help accommodate your editing tasks. The brainchild website of video producer Tim Kolb, Style4Type offers free and premium Premiere Pro title templates for users to utilize on their projects. Tim also examines title sequences from movies and television to provide insight into the design and placement. With many templates to download, users will have a vast array of title styles for any project. 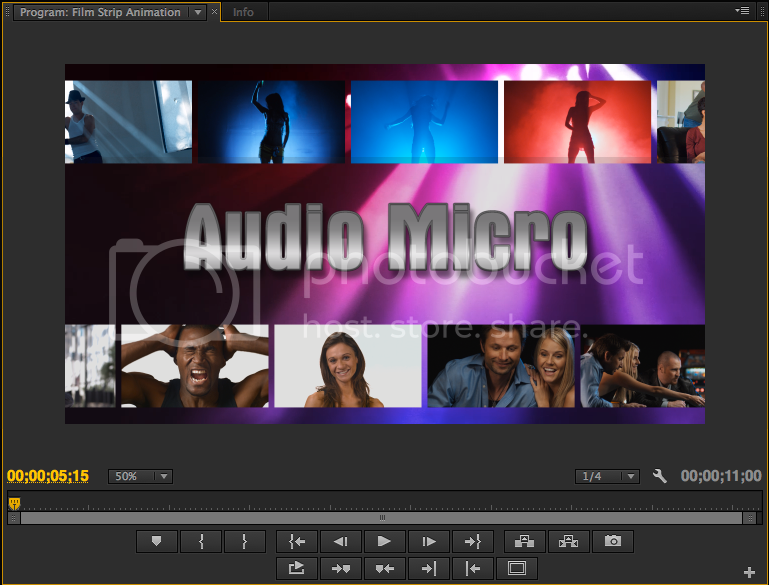 Created by Premiere Pro certified trainer Jarle Leirpoll, this site provides presets and title based templates for users of Premiere Pro CS5 to CC. Jarle has released chapters of his upcoming Premiere Pro book on how to use the title tool for compositing and motion graphics. Below are a few pictures of some the templates you can download. You can download some of his project templates here. The many developers from FxFactory have created a variety of titling plugins to take the process out of creating from scratch. Although many of their title plugins exist for FCP X, there are a group of developers who’ve made title plugins for Premiere. FxFactory has Manifesto for basic titles, rolling credits and crawls, as well as Star Titler for the Star Wars enthusiast. Yanobox has Motype, which is a title animation plugin that utilizes a variety of motion graphics parameters in 2D and 3D. LucaVisualFX has a Random Text generator for unique title sequences and other features. Finally, SugarFX has Movie Credits and Rolling Credits for creating film style titles with little to no effort. All of these plugins work within the FxFactory engine, which has been ported to Premiere 4 and on. One downside is that it is only available to Mac users. ActiveText is a set of ten free title plugins which can simplify the most common types of quick text captions and subtitles. All an editor has to do is use a transparent video layer and drop one in with the ActiveText filter on it. 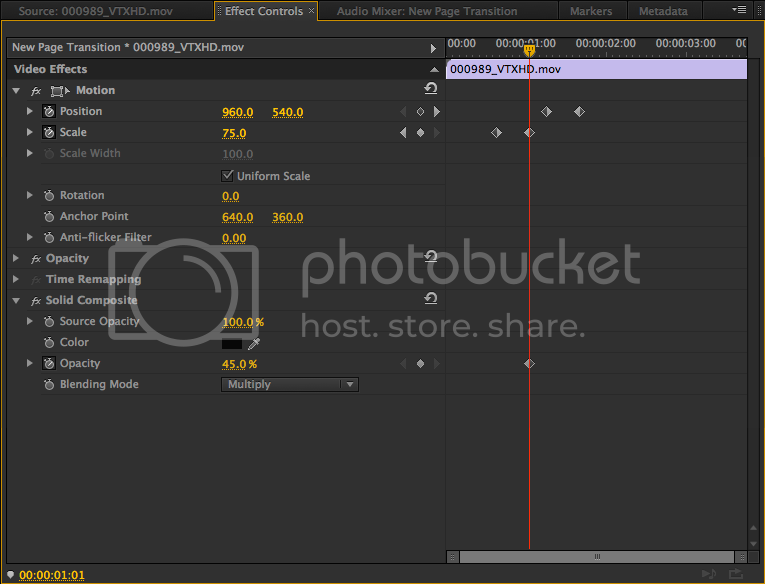 Within seconds, you have a unique title animation that would be close to impossible to create in Premiere without a lot of compositing. Unfortunately, these plugins are only available for Mac users. A very integrated and flexible tool, Titler Pro is the fast and professional solution to help you create beautiful titles with ease. With a vast array of drag and drop animations, users can create professional looking titles effortlessly. With this plugin, editors can minimize the need to dynamic link titles to After Effects, and can create them within the program. Below is a brief demonstration of what Titler Pro is capable of doing. There are more titling plugins for Premiere that I probably missed; especially from its biggest companions, Photoshop and After Effects. Overall, if you need a title or title animation in Premiere Pro, there are many ways to go about it. 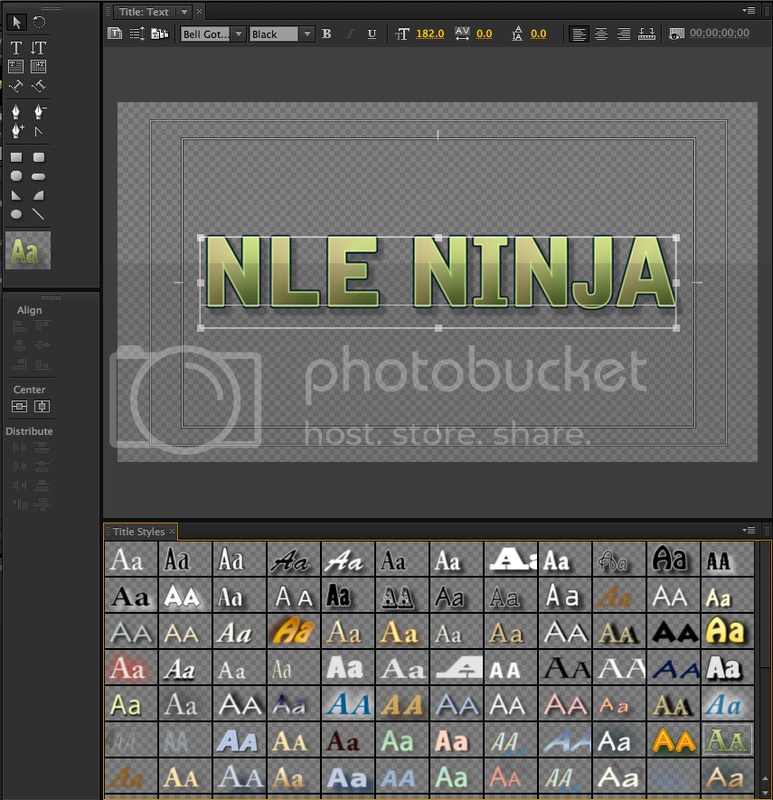 I’m the NLE Ninja asking you to stay creative. For the last 5 years, After Effects has been my go to compositing and motion graphics application whenever I need something beyond the depth of my NLEs. AE has the ability to do a lot of amazing things that would probably take pages just to list. 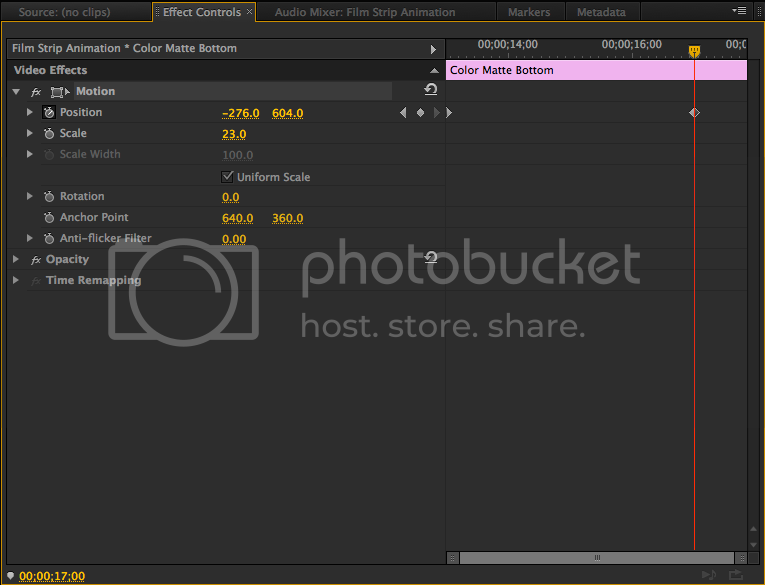 With the filters and options that come bundled with it, the user can take on common to complex post production needs. One filter that I believe stands out above the rest is the Fractal Noise filter. This filter has been the basis of many creative and complex effects. On its own, you can create a myriad of assets such as backgrounds, overlays, textures and more. Of the many templates I’ve used, Fractal Noise has been used in about 80% of them. Within its parameters, a user can manipulate its parameters and create something unique. Used with other filters such as glow, blur and more, the possibilities are expanded. I’m going to show you 3 breakdowns of Fractal Noise designs you can use on your next project. In this example from author Chad Perkins‘s book Cheat in After Effects 2, I have a fractal noise background which looks like bars of light. The solid is set to 1920 x1080. Within Fractal Noise parameters, the fractal type is basic, the noise type is set to block, the contrast and brightness are modified, the transform settings are modified drastically, complexity is between 2-4 and the evolution is animated over 5 seconds. Combined with the Tint and Corner Pin filter as well as an adjustment layer containing the glow and curves filters, you get this cool animated bar background you can use for a high action title sequence. This mograph element is relatively easy to accomplish using the Fractal Noise filter. From this example of Harry Frank‘s Form Backgrounds, he accomplished this by manipulating these fractal noise settings. With composition set to 3000 x 1080, he set the fractal type to basic, noise type to soft linear, modified the contrast and brightness between -100 to 200, transform settings to get the streak look and animated the evolution over 9-10 seconds. He also set an expression for offset turbulence that would affect its position over time. When combined with the Tritone and Glow filters, you get a streaks overlay you can composite into your footage or animations. One of the best ways to use Fractal Noise is when you need an animated texture. With this text layer in my composition, I will place an animated fractal noise solid into my text. Here is my settings and result of my fractal noise below. With my text layer above it, I will set my fractal noise beneath to Alpha Matte. Now, my text will inherit the fractal noise as a texture and with some further tweaking, I can get a unique text design that looks something like this. As you can see from these breakdowns, Fractal Noise is a versatile filter. On its own, it can create a lot of items. Grouped with other filters, it becomes an enigma of creative awesomeness. Next time you are in After Effects, play around with the Fractal Noise filters and see what you can create. You might create something quite amazing. One of the many things that amazes and intrigues me are the animations that you can find in commonly used devices. Everything from your smartphone, computer and gaming system provide unique ways of navigating their respective interfaces. One of the animations I enjoy seeing on my iPhone is the new page animation when using Safari. The current page you are on will scale down, shift to the left and a new page will come in and take over the screen. I’m going to show you how to create that animation in Premiere. A transition like this exists within the FxFactory collection so check that out if you want to add that to your arsenal. I’m going to set up the animation for the clip on Track 2. Let’s move 15 frames into the clip. Next, set a keyframe for scale at 100. Move 10 frames forward and change the value to 75 on the scale parameter. Before we move it offscreen to the left, let’s scale and position our clip on Track 1. I’ll scale it down to 75 as well and position it so there is a small gap between the clips. Let’s animate our clip on Track 2 offscreen to the left. I’ll set a keyframe for position about 5 frames from my last scale keyframe at its default value. Move 10 frames forward and position the clip until only a small piece remains on screen. Go back to the first position keyframe. Highlight the clip on Track 1. Set a keyframe for position at its current value. Move 10 frames forward and change the value to its default position. Move 10 frames forward. Set a keyframe for scale at its current value of 75. Move 10 frames forward change the scale back to 100. I’ll add a Solid Composite filter to both clips. For the clip on Track 2, change the blending mode to multiply. Set a keyframe for opacity at 45 where the last scale keyframe is at. 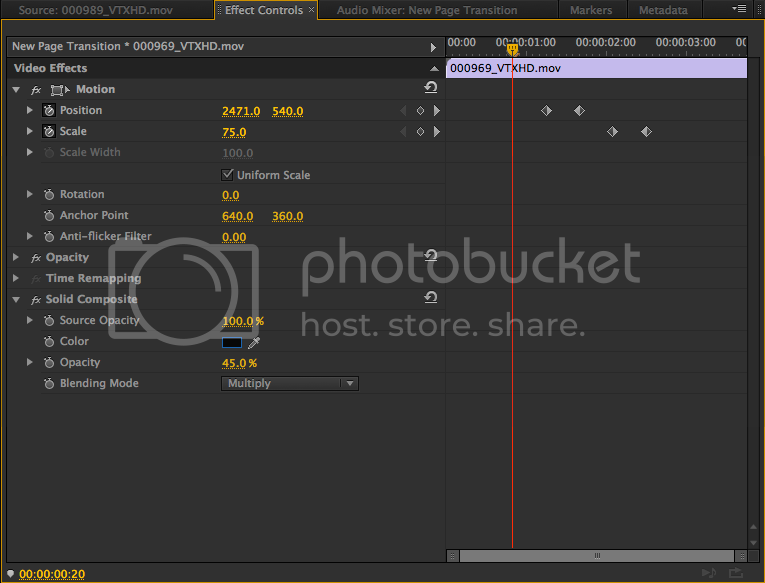 Move back 5 frames and set another keyframe with a value of 0. Copy the filter. Move to the clip on Track 1. 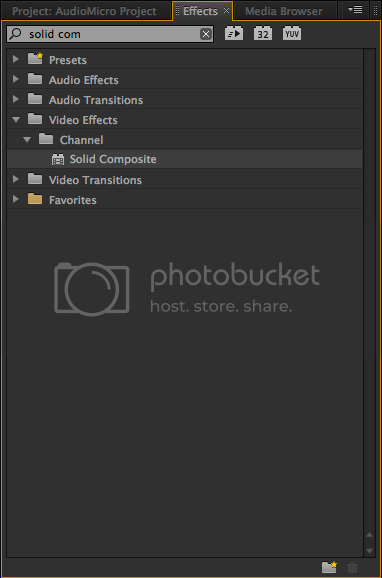 Paste the Solid Composite filter. Delete the keyframes for opacity leaving it with a value of 45. This next step is crucial to sell the animation. Move the playhead 3 frames forward from the last position keyframe on Track 2. Make an edit. Place the clip on Track 1 on Track 2 and the clip on Track 2 on Track 1. With the playhead at the edit point, set a keyframe for opacity in the Solid Composite filter. Move 5 frames forward and change the value to 0. One thing before we proceed. Change all keyframes you set to Auto Bezier to get a smoother animation. The final piece of the puzzle is a gradient background. Highlight your clips and move them one track up. Create a gradient background in the Title Tool or use a gradient from Photoshop. Place the gradient on Track 1 and make sure it’s the length of your clips. That’s how you make this over and under transition in Premiere Pro. As I said before, this is based on a transition from Noise Industries which is available for Premiere Pro CS6 on Mac. Try this out and see if you can take it a step further. 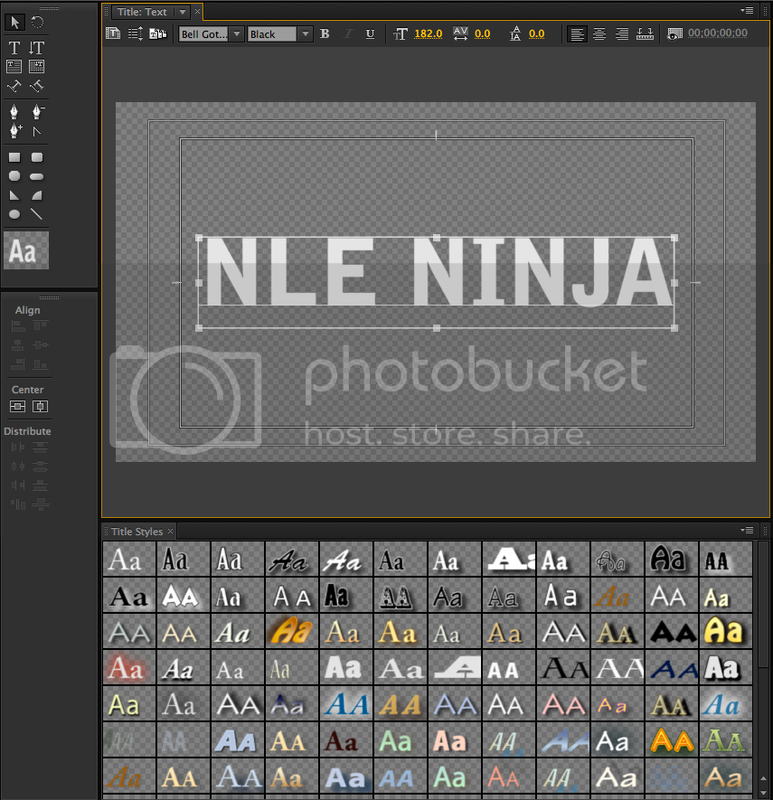 I’m the NLE Ninja with AudioMicro asking you to stay creative. One of the many animations I enjoy creating are moving filmstrips. I’ve found many uses for this animation over the last few years across various projects. Learning how to create this in Final Cut Pro 7, I’ve been able to adapt the same concepts over to Premiere Pro. In this tutorial, I will show you how to create a moving filmstrip animation with a title you can customize for later use. I’ve provided a video tutorial for visual reference in case you want to see my result. Let’s get started. I’m working in a 720p sequence but these techniques will also work in a 1080p sequence but values will vary. I have a color matte in my timeline that is scaled to 100 percent. Let’s bring the scale down to about 23 percent. 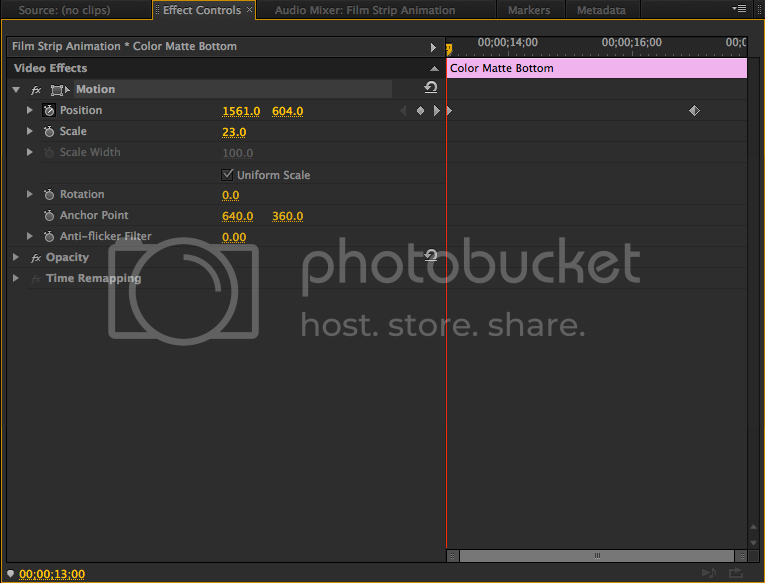 Next, I’ll enable title safe and position the color matte on the action safe line. Now, that we have the color matte in place we can begin animating it. With the playhead at the beginning of your timeline, set a keyframe for position. Move the matte off-screen to the left. Jump ahead 4 seconds and move the matte off-screen to the right. You should have a scrolling animation of your matte moving from left to right. To turn this into a filmstrip animation, all we have to do is duplicate the color matte. Let’s duplicate this about 9 times so that we have 10 mattes on 10 tracks. Next, let’s offset the mattes on tracks 2-10 by 20 frames. I will select those mattes and type +20 to move them 20 frames forward. Then, I will deselect the clip on track 2 and type +20 to move the mattes 20 frames forward. I will repeat this technique until all of the mattes are offset by 20 frames each. We now have our mattes flowing from left to right in a filmstrip animation. I will create another filmstrip on the bottom of the screen on the action safe line but have this moving from right to left by following these exact same steps. Now that we have our color matte filmstrips, I can replace the mattes with footage. 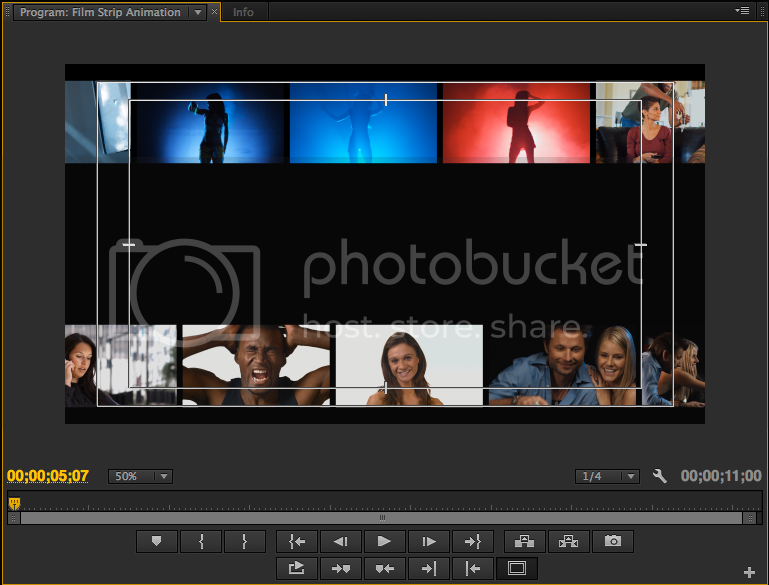 To do this quickly, I will option drag some stock footage on each matte. You should get something that looks like this. After you’ve done that, nest each group of clips into 2 separate sequences. Let’s add some finishing touches to this animation. Right now, we have no background to compliment these moving filmstrips. You can go about it a few ways in terms of backgrounds. 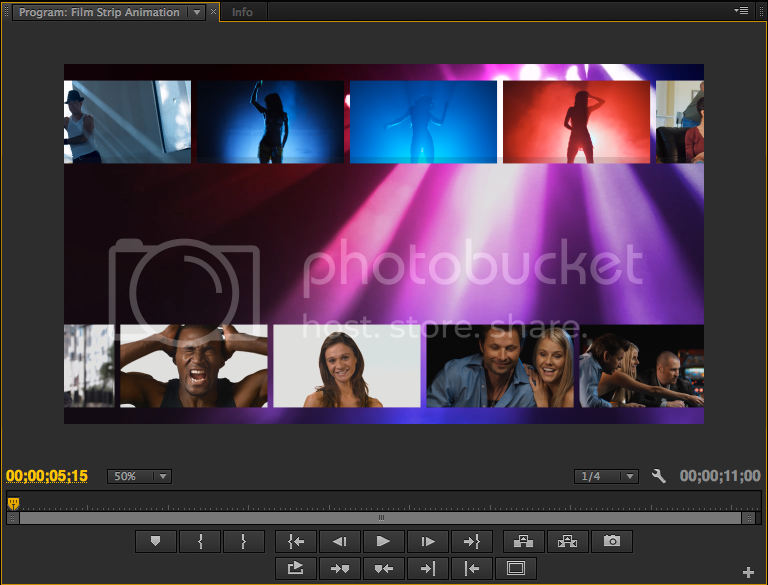 You can create one from scratch using any available filters or import a stock motion background. I will go with option 2 and use a stock motion background. Last but not least, let’s add a title from the title tool to finish it off. The title can say anything you want it to say. Before you know it, you have an animation that can be used for an intro, interstitial or whatever you can think. Sky is the limit. You can take this animation further by rotating the filmstrips or have them coming across vertically. So the next time you need a simple animation done, try this out. If you are a Mac user, Coremelt offers a plug-in in their Coremelt Complete set called Image Filmstrip that does this animation and more. As editors, two of the items we deal with quite often are titles and freeze frames. Each NLE has their way of creating them. Some are easy to use while others may be a bit complicated to deal with. In Premiere Pro, it has its own way of dealing with freeze frames and titles. As of writing, I know 2 ways that are possible to create freeze frames in Premiere Pro. I’ll discuss the best practices for using those more in this article. The title tool in Premiere Pro opens up a separate window in the application that allows you to do a multitude of things. For some editors, the title tool in Premiere Pro is a flexible option to create very detailed and unique titles. For others, it can become a bit tedious when you need to create multiple titles or make small modifications. In this article, I’m going to share a tip that deals with going through the layer styles that are available in Premiere Pro without changing the font or size of your text. Using this option to create freeze frame is easy to pull off. The best part is that you can do it in the Source and Program monitors. All you have to do is park your playhead on a particular frame you wish to freeze. Then, click on the camera icon in either monitor. 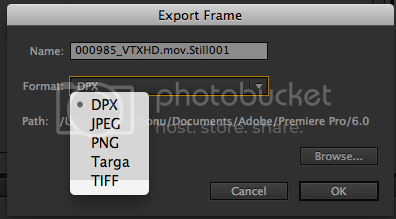 This will bring up an option to export the frame as either the following image formats: DPX, JPG, PNG, Targa and TIFF. This wiki explains the benefits of using certain image formats. Once you have decided on a format, name it accordingly and choose a destination. Afterwards, you can hit OK to save it. Now in order to use this image in your timeline, you have to import it into your project panel. After you do that, make an edit and drop it into your timeline after the point you exported it from, creating a brief or long freeze frame. I find this option best when I need to send a reference frame to identify a subject, do work in Photoshop or use as a screenshot. I feel this process can be a bit time consuming when I need to freeze-frames quickly and easily. I believe this option to create freeze frames is more useful when you need to do it quickly and easily. All it requires is an edit point in the timeline. I have a clip in my timeline and the playhead is parked on a frame that I want to freeze for a few seconds. I’ll make an edit point where I want it to begin. Next, I’ll right click and select Frame Hold. A dialogue window pops up and gives me a few options. I will select Hold On In Point and hit OK. From that edit point on, the clip will be frozen at that frame. The benefit of this method is that it doesn’t require as drawn out of a process as the first option does. The drawbacks are that I have to be careful with edit points and that my freeze frame will last only as long the piece of footage I made the edit point at. If I wanted to have a quick freeze frame and then go back to the footage playing, I would have to make an edit point where the freeze frame would start and another where I would want it to begin again. If you want to extend the length of the freeze frame, you will have to either change the duration or use the Rate Stretch Tool. Overall, either method has their pros and cons. This is a tip I learned only a few days ago and plan on using it quite a bit. Premiere Pro comes with some title styles you can apply to your text. The only problem is that whenever you click on one of them, the text changes in font and size. By holding down this key, you don’t have to worry about losing your font choice or size anymore. I have some text in the Title Tool. I’m going to highlight it and move to the title styles panel. If I hold down the option/alt key and click on one of the styles, my text will inherit the look but maintain its font and size. As long as you have the option/alt key held down, you never have to worry about selecting a title style or your text changing font and size. This is a handy tip to know for when you start building a library of title styles.